Massive Mens 14k White Gold Vintage Genuine Jade Jadeite Ring. 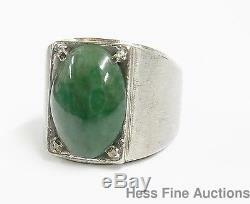 Title: Massive Mens 14k White Gold Vintage Genuine Jade Jadeite Ring. Description: This handsome ring is a size 7 ½, with a massive presence. It has a satin finish and beautiful deep green Jade oval cut stone. Please enlarge our images for best viewing. Other materials or gemstones : Jade, routinely enhanced. 15 x 11 x 5mm. Approx Size or length: 7 ½ ring size. Front setting is 17mm long. Condition: Stone is glossy and in fantastic condition. Ring has been previously sized. Metal could use buffing and has some surface wear. Stamping or Factory Markings: 14k. Total weight of piece: 12.5 grams. Estimated size of package: 6 x 4 x 2. This is because credit cards require both a signature and tracking. Hess Fine Art: Setting the standard for online auctions sellers since 1997. Get FREE counters from Vendio today! Get Vendio Gallery - Now FREE! The item "Massive Mens 14k White Gold Vintage Genuine Jade Jadeite Ring" is in sale since Wednesday, January 13, 2016. This item is in the category "Jewelry & Watches\Men's Jewelry\Rings".